If you grew up on the sound of A Tribe Called Quest, you must have secretly hoped there would be one more album. Something, even if it was just a compilation of sorts, or a clearing of the vaults. But you had to believe that one day the group would find a way to clear out the bad air, walk back into the studio, and give us something we couldn’t see coming. The years ticked off. Reunion tours and one-offs came and went, ending in statements that this was the last Tribe show. That’s a wrap. The group is done. Statements only to be followed by another tour, another show. In March of 2016, news of the end came. Malik Taylor, better known as Phife Dawg, had passed away after a lifelong battle with diabetes. Without Phife, there was no Tribe. What they’d produced would be all there was, and there would be no final act. Meanwhile, the record — to be titled We Got It From Here … Thank You 4 Your Service — was in process. Conceived after a Tribe performance on The Tonight Show that happened to coincide with the 2015 terror attacks in Paris, the band quietly began piecing together the full album. After Phife’s death, production continued, with the album becoming not just a comeback piece for the group, but a showcase and a farewell to one of its founding members. It was also designed as a deeply political record, and a staggeringly prescient one. For all of the achievements of this album, perhaps the most remarkable one is its timing. 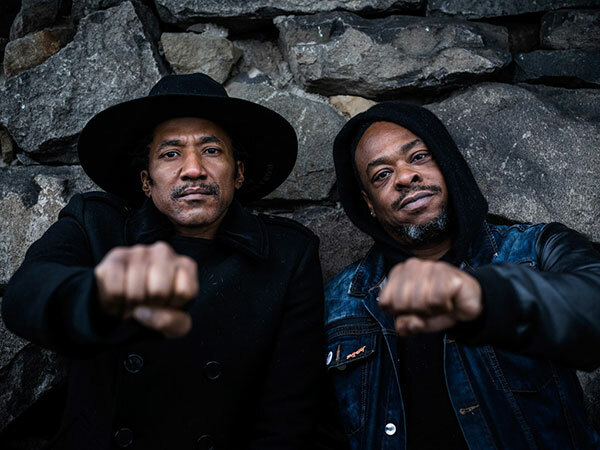 After an eighteen-year recording hiatus, A Tribe Called Quest had somehow managed to deliver the most important musical response to the rise of Donald Trump just three days after his election. A few months ago, the Grammys managed to completely snub a record named by many as not only one of the year’s best, but possibly the best work ever put out by a founding force of hip hop. But the oversight can’t shake the fact that, over a year after its initial release, We Got It From Here … Thank You 4 Your Service remains — and will remain — one of the essential albums of its time. To understand why the album is important, it must first be understood why it was impossible. In broad terms, one does not simply come back from an eighteen-year layoff without some serious rust in the machinery. When A Tribe Called Quest seemingly closed the books on their collaboration with 1998’s The Love Movement, it was supposed to be for good. Their reunification in 2008 for the Rock the Bells Tour ended in another acrimonious split — wonderfully documented in Michael Rappaport’s film Beats, Rhymes and Life: The Travels of A Tribe Called Quest. Anyone who has seen the dynamics at play in that film had to believe that whatever the members of Tribe accomplished in the future, those accomplishments would not come as a unit. If acrimony wasn’t an issue, however, age should have been. Hip hop has always been a young person’s game. This probably has less to do with the talent of emcees and more to do with the young age of the art form. It’s not that the earlier generations aren’t respected. It’s just been generally assumed that if you shook up the game in your early twenties, the odds are you’re not going to do it again in your mid-forties. Maybe as a producer, sure, but as the name on the album cover. Maybe those were overrated issues. There was a time when a forty-five-year-old rock and roller was considered an outlier, too. And artists have frequently worked their way past old beefs to find their way into collaborating again. Old habits, especially of the glory days, die hard. But this wasn’t the same old thing. Phife Dog was gone. Ali Shaheed Muhammad, who had co-produced every Tribe album with Q-Tip, was unavailable, having signed on to compose the score for Marvel’s Luke Cage. And yet the album came together. Pieces at a time. Jarobi White, a founding member who hadn’t been a regular since Tribe’s first album, was asked to do a staggering amount of heavy lifting in Phife’s absence. Busta Rhymes, who arrived on the scene with a blistering verse on the track “Scenario” from Tribe’s classic 1991 release The Low End Theory, stepped up to the mic. Consequence, a guest on Tribe’s last two albums, was there. And then came the guests: Jack White. Kendrick Lamar. Elton John. Kanye West. Anderson Paak. All of them appearing in New Jersey to record live in the studio, then moving on. The album was announced in late October, 2016. A few weeks later, just days after an election the whole album seems to be warning about, it emerged. That kind of arc feels like the work of a hack Hollywood screenwriter. The conditions. The moment. It all seems the record was pointing directly to its own importance by landing with a bang at the moment it was most necessary. None of which would have mattered if the album wasn’t any good. I was terrified to buy the new album. It was a lack of faith. I knew I’d love hearing from these messengers of my youth. But I was afraid I’d have to convince myself to actually enjoy the record for what it was, and not for what I wished it to be. Leading off the album, and initially seeming to be a futuristic look at widespread space travel, “The Space Program” quickly morphs into a breakdown of the brutality of rampant gentrification by reframing it as interstellar colonization. The track is a sonic marvel, incorporating everything from Gene Wilder’s performance as Willie Wonka to Vincent Price’s laugh on Michael Jackson’s “Thriller.” The track simultaneously harkens back to the groups’ cosmically minded origins while attacking your ear with a modern sound unlike anything the group has produced before. But perhaps the greatest revelation on the track, and the clue that the album is going to be something truly special, is the performance of Jarobi White. White is a founding member of the group, and has been called the group’s soul by Q-Tip, but hasn’t been a full-time member since 1991 (when he went to attend culinary school). And yet the first fully realized verse on the album’s first track belongs to him. What this points to is a central theme of the record: Everyone is involved, and everyone is bringing their A-game. That becomes the album’s M.O. — a showcase of stars where nobody is the star. On the track “Mobius,” not one of the founding members appears, instead leaving the verses to longtime guests Consequence and Busta Rhymes (who sounds like he’s having more fun than he’s had in years). “Conrad Tokyo” features a rare instrumental, with an extended organ solo taking what normally would have been a place for someone to take a verse. Then there are the guest stars, all deployed for maximum effect without ever taking over the record. Kendrick Lamar destroys everything in sight on an eight bar rampage in “Conrad Tokyo,” then promptly vanishes. Kanye West sings the hook on “The Killing Season,” then fades away. Elton John emerges from a sample of his own voice to provide piano and vocals on the end of “Solid Wall of Sound.” Track after track, guests and regulars rotate in where needed, then hand off the mic, and the record begins to feel more and more like a communal effort. The track is evidence of how far ahead the group was looking, how clearly they saw, before so much of mainstream America, the dangerous waters the country was navigating. Or, to put it another way, it was doing what hip hop has always done. Troublesome times, kid. No time for comedy. And on the album’s final track, “The Donald,” he does nothing short of steal Trump’s own moniker and place it on himself, a final gesture of defiance in the face of a cultural wave seemingly bent on erasing him. We Got It From Here … feels like a distillation of everything the group has provided before. There’s the esoteric playfulness of People’s Instinctive Travels and the Paths of Rhythm. There’s the jazz-infused drive of The Low End Theory and Midnight Marauders. The darker themes of Beats, Rhymes and Life. Nothing of who they were is left behind. And yet nothing feels like a throwback. It feels, in the end, like the album the group would have produced had they continued cranking out albums for the last eighteen years. It’s a full realization of their gifts, gifts that have been given another generation to grow. Everything they’ve done before is fully distilled, then taken in new and thrilling directions designed to leave emcees and producers half their age scratching their heads. And for those of us who grew up on this sound, and the sounds of groups like Public Enemy, De La Soul, Digable Planets and N.W.A., there’s a certain satisfaction to be had in seeing the influencers of yesterday become influencers again. To see them standing far out ahead of the field, once again waiting while everyone else is trying to catch up. So why does it matter? Why write about an album that came out over a year ago? I can tell you my answer. It’s because I’m biased. Because I’m a fan. There’s no objectivity for me writing about this group, or this record. I grew up on this sound and I wanted one more album. And when it came, it was at the moment I needed it most, and it blew past all of my expectations. Anyone who cares about this group, who grew up on them, will probably say the same. But it’s also because this is a great story, and because the record is, and will remain, important. Against all odds, an earlier generation stepped up and took the mic, said “We got this,” and put out an impossible album. They created something of community that allowed them to take back the torch and speak while also demonstrating how to hand it off again. That A Tribe Called Quest has left the building no longer feels like a tragedy. There will be no more records under this banner simply because there don’t need to be. A Tribe Called Quest’s final album was more than we could have hoped for. It wasn’t just unlikely. It was damn near miraculous.